OP3239. LA BOHEME, Live Performance, 24 Dec., 1977, w.Conlon Cond. 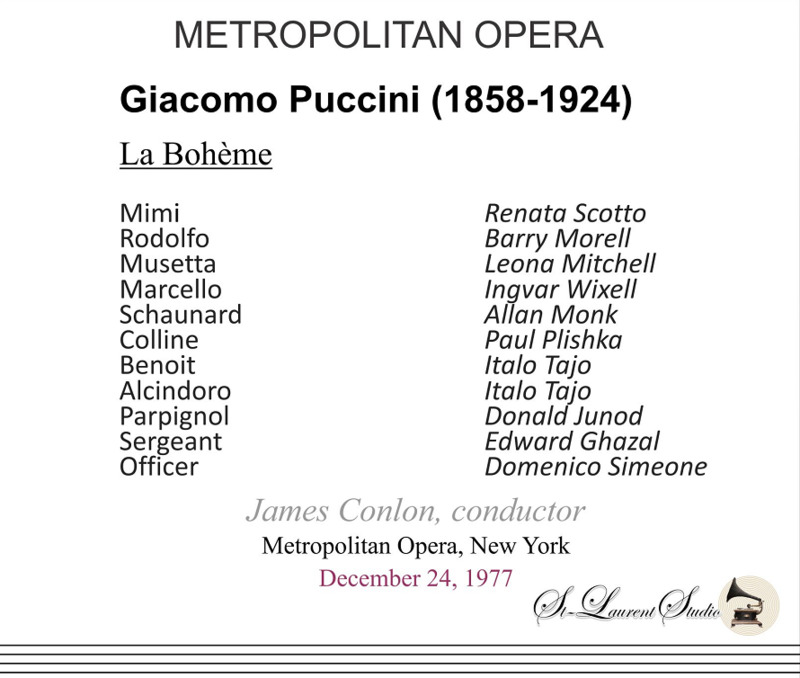 Met Opera Ensemble; Renata Scotto, Barry Morell, Leona Mitchell, Ingvar Wixell, Italo Tajo, Paul Plishka, etc. [This is a case of truly luxury casting in that we have the glorious Swedish baritone Ingvar Wixell as Marcello. In addition to Wixell and the inimitable Renata Scotto, Barry Morell gives a beautiful performance of Rodolfo, ending the first act as written - a rare achievement!] (Canada) 2-St Laurent Studio stereo YSL T-654. Transfers by Yves St Laurent. "Why, one might ask, should one investigate this recording of a broadcast when its principal attraction, Renata Scotto, made two commercial recordings of LA BOHEME? There are multiple answers. The first recording, made in 1962 for DG, suffers from a very poor choice as Rodolfo (Gianni Poggi). The second, from 1980, was made with Alfredo Kraus and is conducted by James Levine, and is very fine. However what sets this Met broadcast apart is that Scotto in performance is different from Scotto in the recording studio, and significantly so. There are details of phrasing, of dynamic shadings, of pointed inflection, moments of risk-taking that make this performance tellingly more vivid than her commercial recordings. 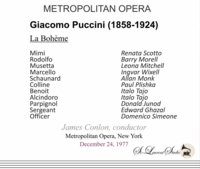 In a season where all three of the 'three tenors' were on the Met's roster (though they had not yet formed their trio) it is hard to understand why the BOHEME broadcast was given to the 50-year-old Barry Morell. The American tenor had a lovely natural lyrico-spinto tenor voice, but it was beginning to dry out by this time. Moreover, he never was a singer with much imagination, and that lack is highlighted when juxtaposed with a soprano who was blessed with an excess of that quality. Morell is certainly not bad, and he sings musically (his aria is transposed down a half-step), with a warm and appealing timbre, and he displays a good generalized feel for the shape of Puccini's line. Leona Mitchell is delightful as Musetta, with a somewhat richer sound than many of the soubrette types who sing this role. She throws herself into the spirit of the character fully, and is clearly having fun while singing beautifully. Ingvar Wixell's Marcello is cannily acted, but by 1977 his voice had lost some of the luster it had earlier. He does communicate sympathetically his warmth toward Mimì while also letting his hair down effectively in the comic scenes. Puccini's genius for this opera is the dramatic juxtaposition of the comic and the tragic, requiring interpreters to be able to switch on a dime, and Wixell is superb at that. Allan Monk is excellent as Schaunard, and Paul Plishka is luxurious casting as Colline. And in the veteran Italo Tajo the Met found the perfect basso to take on the dual roles of Benoit and Alcindoro. James Conlon conducts with just the right balance of contrasting elements. He expands Puccini's expansive phrases with richness and intensity, but never lets the momentum sag. He underlines the comic elements of the Bohemians' shenanigans with wit and sharp rhythmic contours. In particular he is an extremely sensitive accompanist for Scotto, allowing her the liberty to stretch phrases and linger over moments where she is making a dramatic point while at the same time keeping the music’s shape. The important orchestral interlude introducing the final scene (just before 'Sono andati') is particularly touching, as it prepares the opera's final tragedy. 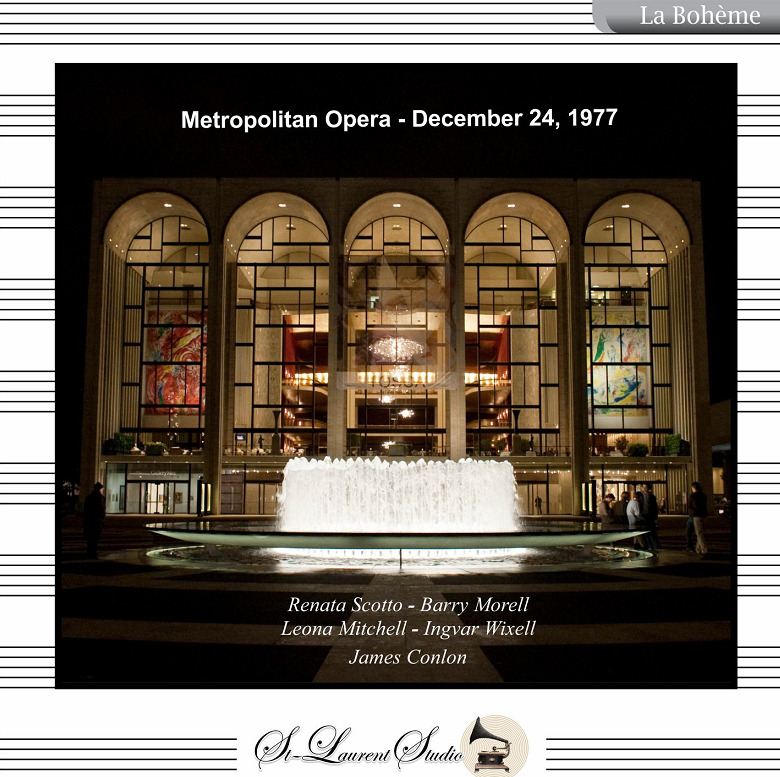 As usual, St. Laurent Studio's transfer is of the highest quality, and the Met's broadcast engineers original stereo recording was very clean and well balanced. No notes come with this, but detailed tracking information and full cast are included. St. Laurent Studio recordings are available from Norbeck, Peters & Ford (www.norpete.com). This is highly recommended for Scotto's uniquely moving Mimi, for Conlon's imaginative conducting, and for the overall sweep and impact of a fine live performance that is almost impossible to deliver in the recording studio." "Renata Scotto is a musician. She is a studious woman who is devoted to her career. I have seen her at work and her dedication to opera is complete, profound, and remarkable. She will finish singing only to return to the score and study again. She has given herself to opera, body and soul; and she never stops learning. That is why her characterizations are always so fresh." "Barry Morell, a tenor who sang leading roles for 21 years at the Metropolitan Opera as well as at other major international houses, sang 7 leading roles in 22 performances in his first year with the Metropolitan Opera, a record that, it was claimed at the time, was matched by only two other tenors, Enrico Caruso and Edward Johnson. Jay S. Harrison, the music critic for THE NEW YORK HERALD TRIBUNE at the time of Mr. Morell's debut, described his voice as 'a glorious instrument - true, vibrant, splashed with silver'. At 17 he made his stage debut singing 'Ol' Man River' at a benefit for the New York City Actors' Fund, on Broadway. That song is generally taken by a deep voice, and Mr. Morell indeed believed he was a baritone for many years. Mr. Morell eventually met Giuseppe Danise, a noted pedagogue who had married his star pupil, the soprano Bidu Sayao. 'First of all, you are not a baritone; you are a tenor', Danise is supposed to have said. 'Now we shall see whether you can become a singer' [and] after six years of study, Mr. Morell made his debut as Pinkerton in 1955 with what was then known as the New York City Center Opera Company. Two and a half years later the Met invited him to audition, and Rudolf Bing signed him up with the company, where his debut, in the same role, was in 1958. He appeared at Covent Garden, the Vienna Staatsoper, Berlin, Barcelona, and many other international houses, including the Rome Opera, where his debut as Cavaradossi was received with a 15-minute ovation. "Ingvar Wixell, a Swedish baritone whose intelligent, vivid performances in the Italian repertory made him a respected fixture on the world's opera stages, was praised not just for his firm, grainy voice but also for his dramatic acuity, stage presence and sense of spontaneity. Reviewing his Metropolitan Opera debut in the title role of Verdi's RIGOLETTO in 1973, Raymond Ericson wrote in THE NEW YORK TIMES: 'What gave Mr. Wixell's singing its distinction was his awareness of the text. His clear enunciation and concern for words charged the vocal line with vital'. Ingvar Wixell made his American debut in San Francisco in 1967 as Belcore in Donizetti's L'ELISIR D'AMORE and first appeared at Bayreuth in 1971 and at London's Royal Opera House in 1972. In the six years after his Met debut as Rigoletto he sang 81 performances with the company. He ended his career in 2003 singing the music teacher in Strauss' ARIADNE AUF NAXOS at the Malmo Opera in Sweden. He was best known for his steady-toned, riveting portrayals of the major baritone roles of Verdi." "In 1973, Leona Mitchell made her debut as Micaela in CARMEN with the San Francisco Opera, and subsequently made her Metropolitan Opera debut on December 15, 1975 in the same role. She sang the role of Bess in the first complete recording of George Gershwin's PORGY AND BESS from which she received a Grammy for 'Best Opera Recording'. Miss Mitchell has contributed to several recordings, had many television appearances, and served as honorary chair for Black Heritage Month to the Oklahoma legislature. In 1988 Leona Mitchell performed the role of Liu from TURANDOT, directed by Franco Zeffirelli, at the Metropolitan Opera. Miss Mitchell was a leading Soprano with the Metropolitan Opera of New York for 18 seasons. Many of her roles at the Met were varied and illustrious. She essayed in many new productions: ERNANI, TURANDOT and AIDA. On July 5, 1986, she performed on the New York Philharmonic tribute to the 100th Anniversary of the Statue of Liberty, which was televised live from Central Park on ABC Television."